On National Fragile X Foundation leads an advocacy program to advance research funding for Fragile X and programs to provide better lives and opportunities for individuals living with Fragile X and other intellectual and developmental disabilities. 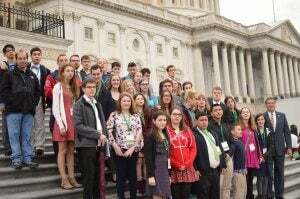 The pillar of the program is Advocacy Day, when members of the Fragile X community come to Capitol Hill at the beginning of each year to advocate for Fragile X. They descend on Capitol Hill to relate their stories about Fragile X-associated disorders, their families, and policies that support Fragile X families such as research at the NIH and DOD, research and public health programs at the CDC, ABLE accounts for savings, facilitating the use of potential new drugs for treatments and a cure, health insurance, and policies that help improve the status quo for adult and families living with intellectual and developmental disabilities. Additionally, throughout the year, advocates meet in home districts with their members of Congress as STAR Local Advocates and contact members of Congress when issues arise. Overall, our goal is to be a voice of solutions, work across party lines, and improve the lives and opportunities of people living with Fragile X. Restore Fragile X as an authorized research area for the DOD’s Peer Reviewed Medical Research Program. Fragile X was included for the past 10 years, but was not included in FY19. The Appropriations Committee authorizes the medical conditions, disorders, and diseases the program may research through report language each year. Which research is funded depends on the peer review process. Support for Fragile X at the NIH and the CDC. The CDC has an annual line item in their budget request for $2M for Fragile X, and the NIH funds projects as they are peer reviewed and, additionally, funds three Fragile X research centers for 5 years at a time. The Centers are funded through the end of FY19. Improve coordination of care for children across medical providers and even state lines. Gather national data on complex conditions to help researchers improve treatments for rare diseases. Potentially reduce health care spending, compared to the current system. Senate lead sponsors are Sen. Grassley, R-IA, and Sen. Michael Bennet, D-CO and Rep. Castor, D-FL-14, and Rep. Bilirakis, R-FL-12. Loan repayment and training programs to medical professionals providing care to people with IDD in HSRA’s Workforce Development and Training Programs including the National Health Service Corps Scholarships. Financial incentives for medical providers to treat people with IDD in the form of higher Medicare and Medicaid reimbursement rates. Federal funding for health centers and public health infrastructure such as Federally Qualified Health Centers (FQHC). Eligibility to apply for federal funding for community health center. Helped in securing approximately $350 million in federal funding for Fragile X research and programming. An annual Advocacy Day in Washington, D.C.
A national Fragile X Public Health Program at the CDC’s National Center on Birth Defects and Developmental Disabilities. Fragile X research funding by the Department of Defense (DOD). A comprehensive National Institutes of Health (NIH) Blueprint to guide research targeting all Fragile X-associated disorders. The establishment of ABLE Accounts, which are tax-deferred savings accounts for adults living with disabilities, similar to 529 college savings accounts. Your participation makes a difference because local voices are the most effective. NFXF Advocacy Tool to email Congress, register to vote, and more. A place to discuss and keep abreast of advocacy efforts. The STAR Local Advocacy program helps you advocate with your members of Congress when they are home. The NFXF joined other organizations to support CDC funding. The NFXF joined other organizations to support NIH funding. A letter template for you to use to contact your member of Congress about health insurance, Medicaid, and SSI/SSDI. House letter to the Appropriations Committee to support Fragile X programs and funding for FY19. Senate letter to the Appropriations Committee to support Fragile X funding and programs for FY19. The Congressional Fragile X Caucus’ mission is to increase awareness of the public and private efforts underway to treat patients and develop therapies, and will identify ways Congress and federal departments can better serve families impacted by Fragile X. Learn more about the Fragile X Caucus.